I bought a Nikon D50 second hand. I am desperate to learn how to use it properly, but for the time being I simply point and shoot. Well, maybe not quite, but almost! 2. What will you have for Thanksgiving dinner? If not in the USA, tell us about a special meal, please. I'm not in the USA. Did any of you know that?! Of course, my heart spends most of its life there, but I guess that doesn't count. We have always had a Thanksgiving day towards the end of November, but in our tradition there is no big meal and family get-together involved in the day, just a Thanksgiving service at church. However, we'll probably go for a turkey-and-all-the-trimmings meal on the date of your Thanksgiving Day... just for the fun of it. 3. What's the biggest vehicle you've driven? A bus. Would you call it a coach? A 43-seater bus. I was ... well, let's just say I was very young at the time. Too young to publicize it! 4. Have you ever been on a train? Yes. In the UK, it's a nice way to travel between towns and cities. Within city limits, the trains don't tend to be as nice, although there are years since I was on one of them, so maybe things have changed over the past decade or so. When we were in the USA last year (er, you mean you didn't know we were there? I've never mentioned it? At all? Well, we shall just have to remedy that ;) we went to Six Flags in New Jersey, and I was forced onto a terribly scary train ride. Er. It was scary, Katie. It was terrifying. What do you mean it was the train ride for the under-8s? I'm sticking by my story: It was scary. 5. 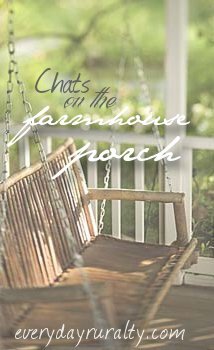 What question would you like to ask people visiting on my porch next week? Ooh, I guess I need to be careful here, because I may have to answer it! "Tell of something you've done you are so glad you did." (the opposite of a regret.... we tend to have plenty of them). Thanks, Patrice, for your questions again, and for allowing us onto your porch one more time. How long d'ya reckon until it'll be too cold to sit on your porch? We have a windchill of about 1C today. I've been in and out from the washing line (my tumble drier is broken) and my hands are raw with the cold. I have to tell you that for the past two days I've been cleaning, tidying and clearing DR's bedroom. I checked with him before I told the world that his mum still has to clean, tidy and clear out his room. Me: DR, do you mind if I tell the world your mum still cleans your room? DR: Er, why would I mind you telling them that? Me: Well, they may think you ought to do that yourself, now that you're the age you are. DR: What's age got to do with it? I've got you. Anyway, the next time I have the ridiculous notion of clearing his room because he's away for two days, would someone do me a favour and remind me that 2 days and a roll of black bin bags is not what I need... It's a week and a Dumper Truck. Prospective wives? Come see me first. Trust me - you'll thank me for it. I was quite surprised at the question 'have you ever been on a train?' as using the train to get around is very common in England, or at least in London. Is it not so usual in the USA? Honestly, having children is the best thing I ever did. For years...eight to be precise, I did not want children at all. I was very selfish. I didn't want the burden of caring for small ones, but then the Lord changed my heart just like that and before I knew those ole parental feeling struck me. The rest is history as they say. The responsibility is over shadowed by the sheer joy they bring to your life. Okay to be fair, there are time when you heart aches. That just goes with the territory, but I wouldn't give it up for a second! Hey, we're getting some cold weather here today, not as cold as it there, but cold nonetheless. Nice to meet you on the porch. Hope to see you again next week - if you've not been buried in bin bags! If you were here, I would invite you to our house for Thanksgiving. Anna makes the best pumpkin pies! I agree with Leslie- if you were here, you'd be invited to join us for Thanksgiving. If you get a dumper truck to clean your son's room, do you think they might let you drive it so you can add that to the big vehicle question's answer? Love to read your answers! You'd also be welcome to our house for Thanksgiving!...It sounds like you could make stops across our continent, eating all the way! I'm glad Ben Franklin didn't get his way w/ respect to out national bird cause I LOVE turkey! :What's age got to do with it? I've got you." Great answer. I love it! Thanks for visiting me and leaving me a comment! Your words always make me smile! And I've got to say visiting here is always a treat! You have such a unique site and way of life :-)! I love the ocean, but honestly I can't imagine living where I could see it everyday! It's a joy to see it through your eyes. What a clever question you came up with! Just wanted to pop in and thank you for your sweet and kind comments on our table blog. We do love making them! I'm so glad I found a few minutes to stop in for your porch chat. x o to you friend!! !